Roofe, who has scored 15 goals in all competitions this season, has reportedly attracted interest from Newcastle United while fellow midfielder Callum O'Dowda has also been linked with a move away. "That's a positive problem and it's a problem we want to have," Eales added. "I can absolutely confirm 100%, we have had no offers for anyone. 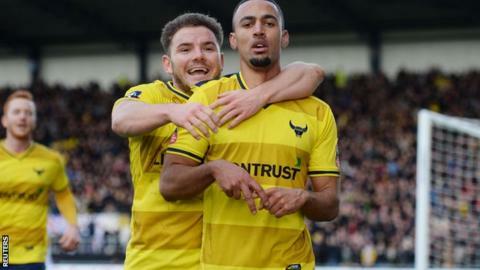 "If you're playing for Oxford United at the moment, would you really want to leave? "We're in the fourth round of the FA Cup, we still have a chance of reaching Wembley in the JPT and we're definitely in the shake-up for promotion this season. "As a footballer, it can't get much better than that." Eales, who took over as club chairman in summer 2014, admits he would not block the likes of Roofe progressing to a higher division. "Footballers have a short career," he said. "Whether it's football or business, I would never stand in the way of anyone's career development. "You have mature conversations and that will be with Michael Appleton (the manager) and the player."